“You know, Bird loves Liverpool”, said one of his friends. The idea and and rule of Footballists, simple and never-changing, is to talk and take pictures of people wearing shirts of their favourite football teams. This is, obviously, a special edition on our blog so let’s make an exception. If Khun Bird would be wearing his favourite shirt today the gods would be angry, that’s what his rule says. Actually, Khun Bird is a god today. More precisely, a god possess his body. It’s complicated. The bizarre vegetarian festival on Phuket, the island known to be a tourist heaven in southern Thailand, easily tops otherwise very bizarre list of events I normally attend in my wanderings through Southeast Asia. In short, the festival, featuring face and every other piercing, spirit mediums and strict vegetarianism is a part of the local Chinese community’s belief that will help them obtain good health, and the rest that comes with pleading with Nine Emperor Gods. However, the original idea somehow developed into a spectacular festival of mind blowing rituals. Besides usual self-mutilation that is known to other religions in other parts of the world, what makes veggie fest in Phuket very special is variety of objects that are used to piece bodies. Car exhaust pipes and alloy wheels, chandeliers, nunchakus, models of racing cars and sailing ships, umbrellas, barbed wire and every possible kind of spikes, knifes and screwers plus M16s and other weapons – it is all pierced through cheeks and mouths of devotees of different Chinese temples as they parade through Phuket. That and many other unimaginable objects sharpened to cut through flesh. If you are in the mood, probably not, for some more pictures and attempts to explain the unexplainable, please look here and here. 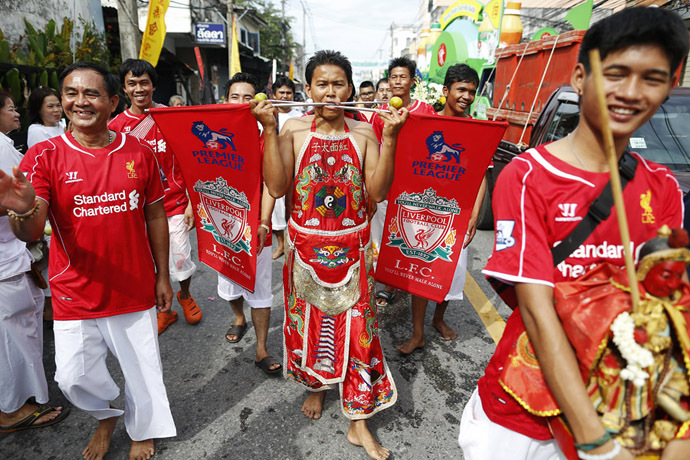 Khun Bird, god for a day, loves Liverpool. 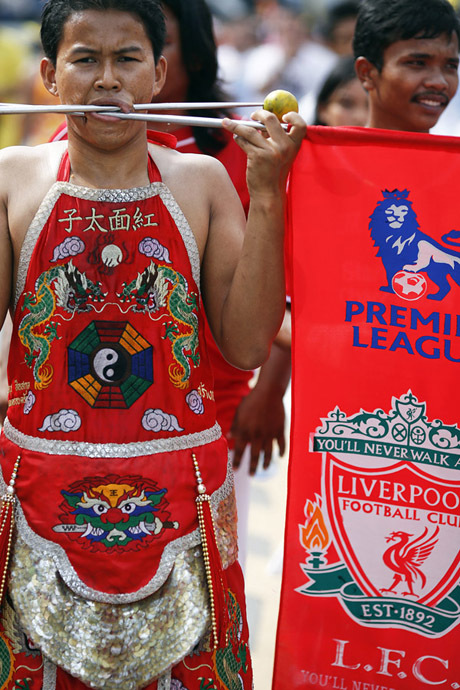 I had no chance to talk to him directly as he was in trance with two metal rods carrying LFC flags, oranges stuck at their sharp ends, pierced through his mouth but members of his entourage, all wearing original Liverpool shirts, briefly explained his passion to me. So I took some pictures and then followed another god, fishing net coming from his mouth, into the crowd. For true believers this would be another strong proof that if you choose the right team, here and elsewhere, You’ll Never Walk Alone. The gods never walk alone. wtf…!! lokk at his cheek dude…. Now that’s dedication to your team! It would really be special to see that guy in the Kop.